Aviation Updates Philippines - Several flights and sea voyages were cancelled on Friday as Tropical Storm Mario (international codename: Fung-Wong) continues to intensify the southwest monsoon that is bringing heavy rains in the vast of Luzon. Civil Aviation Authority of the Philippines (CAAP) director Captain John Andrews said that as of 8 a.m. of Friday, only big aircrafts are allowed to take-off and land at the runway of Ninoy Aquino International Airport due to radar problem. 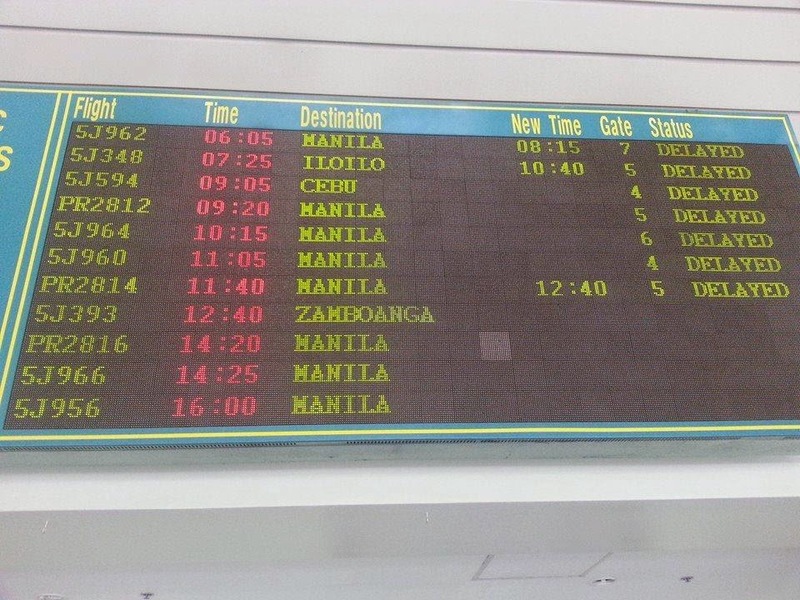 The system was restored at 11:23 a.m. but various airline companies opted to suspend some of their flights for safety. In the advisory released by the Philippine Airlines (PAL) and their budget carrier PAL Express, flights affected by the suspension were PR/2P 2991/2245/2246/2992 (Manila-Zamboanga/Jolo/Zamboanga/Manila); PR/2P 2031/2032 (Manila/Busuanga/Manila); PR/2P 2095/2096 (Manila/Surigao/Manila); PR/2P 2265/2266 (Manila/Naga/Manila); PR/2P 2261/2262 (Manila/Naga/Manila); PR/2P 2263/2264 (Manila/Naga/Manila); PR/2P 2193/2194 (Manila/Tacloban/Manila); PR/2P 2045/2046(Manila/Caticlan/Manila); PR/2P 2059/2060 (Manila/Caticlan/Manila); PR/2P 2191/2192 (Manila/Tacloban/Manila); PR 2P 2981/2982 (Manila/Tacloban/Manila); PR 2P 2021/2022 (Manila/Masbate/Manila); PR/2P 2079/2080 (Manila/Catarman/Manila); PR/2P 9185/9186 (Manila/Tacloban/Manila). The country’s flag carrier noted that affected passengers will be automatically rebooked on the next available flights once weather clears. It added that passengers have the option to rebook their flights to their preferred dates without penalties/charges as long as this is carried out within 30 days from original flight date. Meanwhile, budget carrier Cebu Pacific Air also suspended several flights due to rough weather condition. These include 5J 529/ 5J 530 (Manila/Busuanga/Manila); 5J 521/ 5J 522 (Manila/Naga /Manila); 5J 891/ 5J 892 (Manila/Caticlan/Manila); 5J 893/ 5J 894 (Manila/Caticlan/Manila); 5J 907/ 5J 896 (Manila/Caticlan/Manila); 5J 895/ 5J 898 (Manila/Caticlan/Manila); 5J 135/ 5J 134 (Cebu/Caticlan/Manila); 5J 132/ 5J 133 (Cebu/Caticlan/Cebu); 5J 196/ 5J 197 (Manila/Cauayan/Manila); 5J 513 / 5J 514 (Manila/San Jose/Manila); 5J 327/ 5J 328 (Manila/Legazpi/Manila); 5J 329/ 5J 330 (Manila/Legazpi/Manila); 5J 447/ 5J 448 (Manila/Iloilo/Manila); 5J 977/ 5J 978 (Manila/Davao/Manila); 5J 971/ 5J 970 (Manila/Davao/Manila); 5J 703/ 5J 704 (Manila/Dipolog/Manila); 5J 857/ 5J 858 (Manila/Zamboanga/Manila); and 5J 995/ 5J 996 (Manila/General Santos/Manila?). In its Facebook account, the airline management noted that they will re-accommodate affected passengers in the soonest available flights or they may avail of either free rebooking of flight within 30 days from original departure date or full refund and travel fund. Meanwhile, 704 passengers are now stranded in various ports in the country as the Philippine Coast Guard suspended sea voyage even in areas without typhoon warning signal due to rough sea condition brought by Tropical Storm "Mario".